SoftwareUpdater checks all active repositories (see the Repositories preferences) for updates to the installed packages, including system updates to Haiku itself. It downloads and installs the available updates in one go. After launching, SoftwareUpdater checks for updates to packages and displays them in a list with their new version and a short description. You can opt to Show more details to include the name of the repository for each package and show both the old and new package versions. Update now will start the download of all the packages and their subsequent installation. 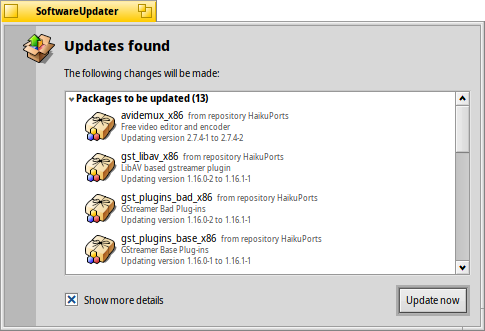 Depending on the packages that were updated, you may have to reboot Haiku to actually complete the update process. Updated applications usually only need to be restarted, while changes to Haiku itself may require a reboot of the system to take effect.